The next level of media players. The Denon DJ SC5000 is a premium-quality digital media player/CDJ unit featuring a built-in multi-touch 7-inch HD display and 24-bit/96kHz digital audio outputs for optimal audio quality. The Denon DJ SC5000 Prime Media Player provides you with all the information and controls you need to play your favourite music, with uncompressed audio formats such as FLAC, ALAC and WAV for the best possible audio performance. The Denon DJ SC5000 provides you with 8 multifunction trigger pads for Cues, Loops, Slices and Rolls, perfect for adding flare to your live performances. The customisable RGB colour around the jog wheel is ideal for low light environments and also adds to the party atmosphere. The 8-inch rugged metal jog wheel with HD central display gives you all the vital information you require for cueing up your audio files with ease. The most recent firmware update for the Denon SC5000 adds another layer of capability and flexibility to an already cutting-edge system. This update notably includes full support for NI Traktor. A quick and easy Traktor NML export makes it simple to elegantly place Traktor playlists, songs, hot cues and loops at the DJs fingertips in readiness for selected collection export to the SC5000. A new 'instant double' feature allows for duplicates of the current playing track to be played at an identical timeline position on a 2nd networked player, or same unit’s 2nd player. In conjunction with this, downbeat detection has been developed to be even more accurate, as well as a newer enhanced BPM detection system. This is amongst a plethora of additional features in this update, for more information, visit Denon's website here. Denon DJ continue to listen to feedback from their community with Prime firmware update v1.2.1. This newest update addresses previously reported issues such as forward/backward scratching pops and clicks, momentary hot cue resets, as well as addressing downgrading firmware to no longer break network connectivity. When combined with the Prime Engine update, you are also able to make this update without connecting to a computer, just adding the firmware directly to a USB stick and uploading to the SC5000/SC5000M. For more information, refer to the Firmware V.1.2.1 pdf at the top of the page. 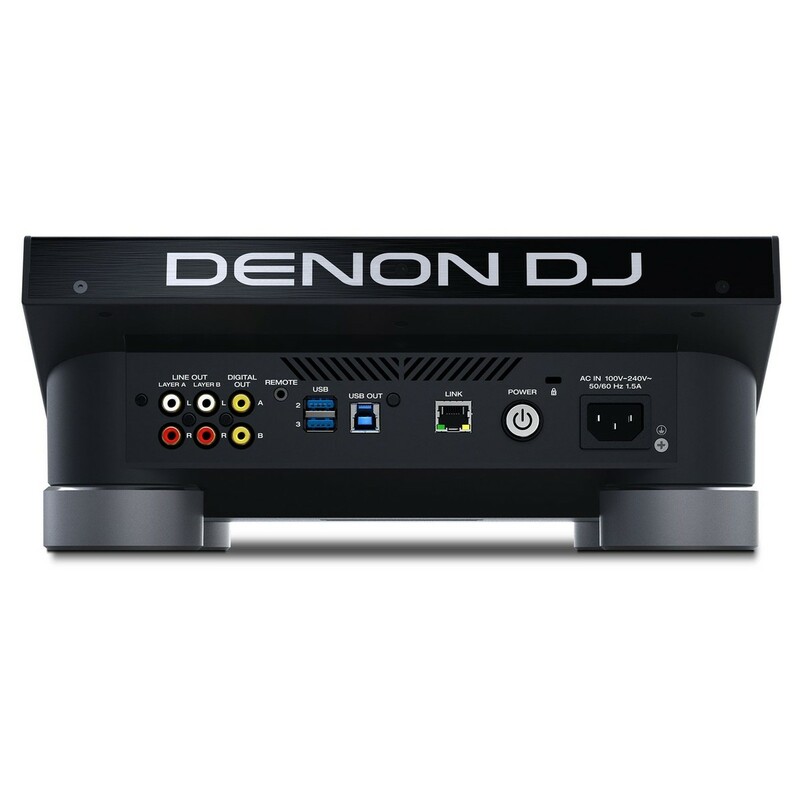 The Denon DJ SC5000 Prime Media Player is the ideal choice for any aspiring DJ and music enthusiast. The built-in 7-inch HD display features a multi-touch screen for fast and easy navigation of your audio files. The screen also displays all the vital information about your audio files including the file format, name of track, artist and much more. 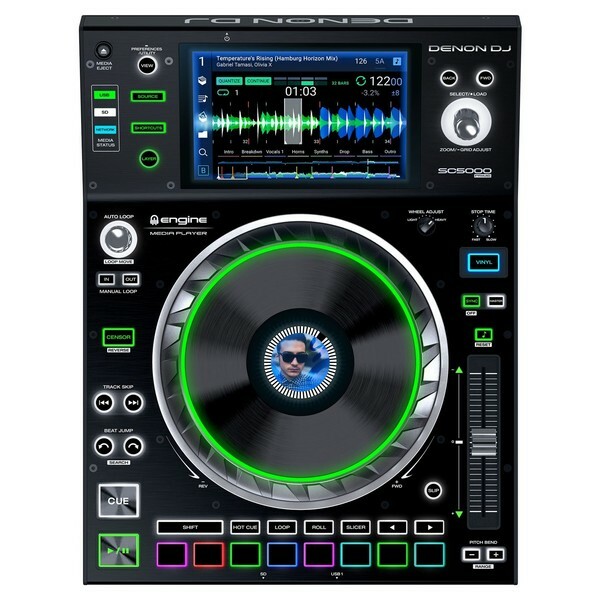 The DJ SC5000 Media Player is one of the first on the market to fully analyse both beatgrid and music key internally, delivering an unprecedented amount of information to the DJ. The unit itself also features 8 multifunction trigger pads designed for triggering Cues, Loops, Slices, Rolls and more. The 8-inch rugged metal jog wheel features a HD central display and a customisable RGB colour for added flare. The multi-touch screen can work in conjunction with the new Engine Prime software that provides an innovative music library and analysis system that lets the user organise, categorise and import audio files with ease. 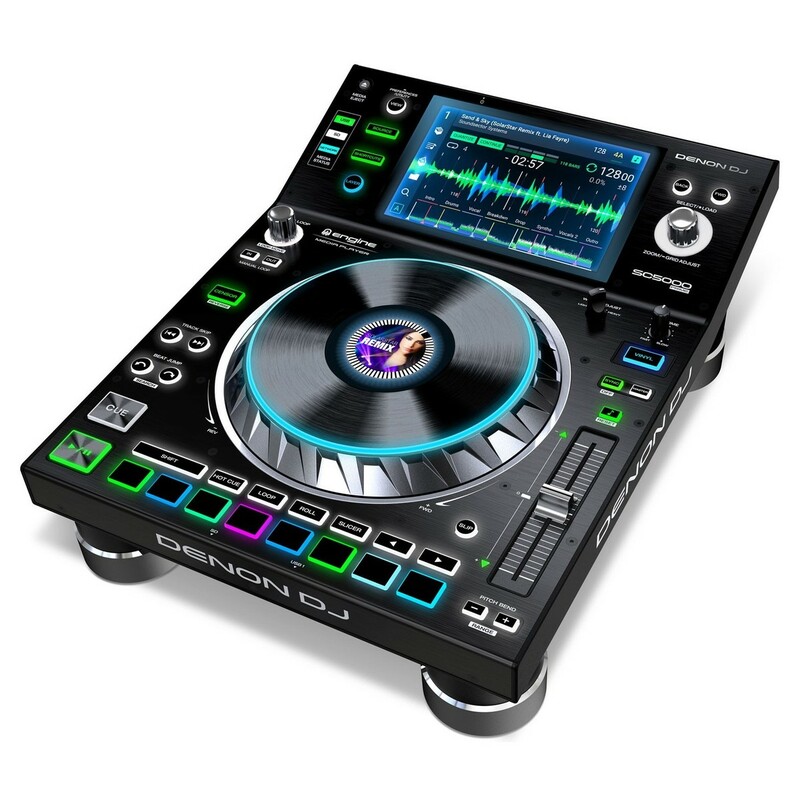 One of the most unique features of the Denon DJ SC5000 digital media player is its ability to play uncompressed audio formats including: FLAC, ALAC and WAV. Combined with the 24-bit/96kHz digital audio outputs, the Denon SC5000 provides unparalleled audio quality and performance. This allows you to deliver the best audio quality achievable, ensuring your crowd hears every nuance of the track as it was intended. Also included is dual-layer playback with individual audio outputs, allowing you to utilise and travel with your music collection store on dual-layer discs for minimising the amount of equipment needed. 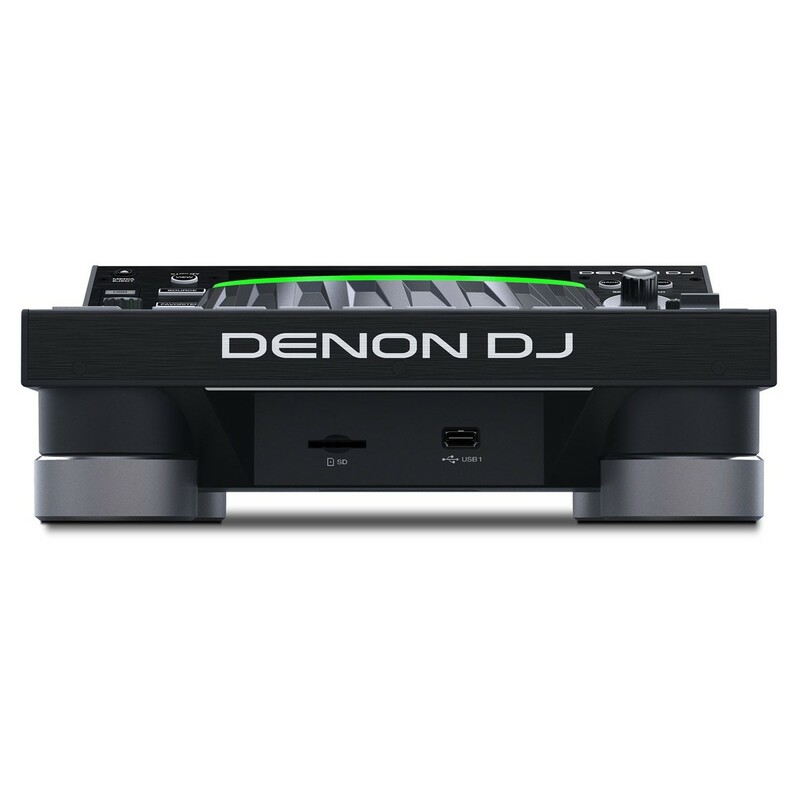 The Denon DJ SC5000 is compact and lightweight in design but retains all the functionality of the more expensive media players on the market. 3 USB connections and 1 SD input are included for music playback allowing you to play audio files directly from a USB flash drive or SD card, so you can bring a large chunk of your music collection with you. A LAN output is also included allowing you to link up four players simultaneously, ideal for the more advanced DJs. The LAN outputs offer music file, digital networking and communication capabilities for the most high-end events.